I investigated distribution of forest floor mammals by automatic camera traps, direct observation, and line census from Jan. 25 to Mar. 26 at the Rainforest Discovery Centre, Sabah, Malaysia. I set up automatic camera traps at 16 sites in the study area such as animal trails and water places for a total of 323 camera-nights. I could record 141 images (0. 20 images/ day on average) of forest floor mammals (14 species at least) including Long-tailed porcupine (Trichys fasciculata), Malay badger (Mydaus javanensis), and Mouse deer (Tragulus spp. ). 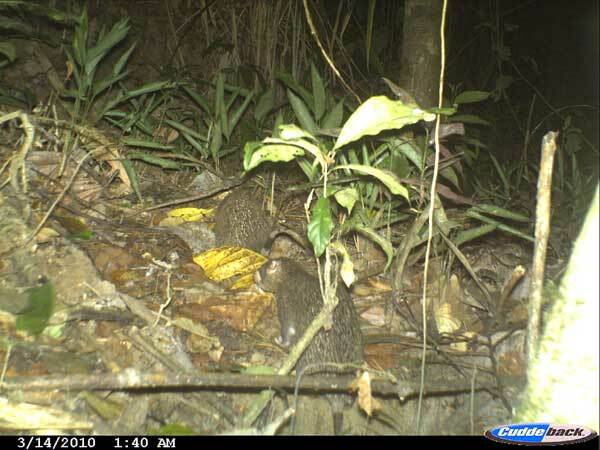 The camera site where images of animals were recorded most frequently was at a water place in a swamp forest (0. 60 images/ day). In order to find animal signs, a line census was carried out. In this censuse, a total of six burrows were found. To determine which animal used these burrows, I set up camera traps in front of the burrows and found that these burrows were used by Long-tailed porcupines or Malay badgers. To investigate diurnal activity rhythm of Long-tailed porcupines, I set up three automatic camera traps at entrance of each burrow of Long-tailed porcupine. Their images were recorded at the entrance of the burrows in early morning, just after sunset, and in midnight. In addition, it was found that at least individuals were using one barrow. I tried direct observations of Long-tailed porcupines during the nighttime from a bird hide near their burrows, but I could not observe them directly because they were very cautious. At present, I am analyzing the image dates more precisely. 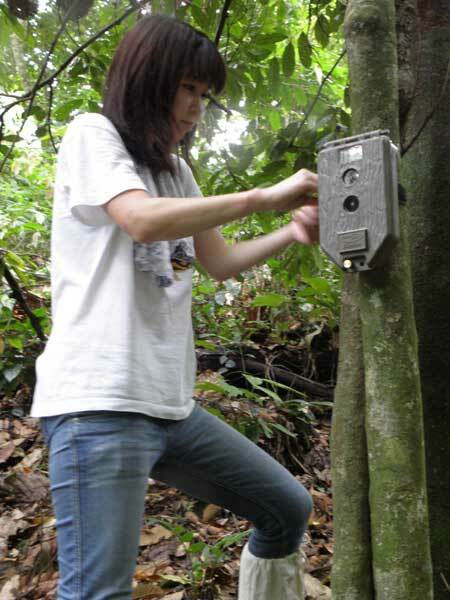 I set up automatic camera traps.